Lyn Belisle is an award-winning teacher, artist, designer and writer who has taught a range of fine arts, humanities, English, and graphic design throughout her career. As an undergraduate, Lyn studied art with Phillip John Evett and Bill Bristow at Trinity University in San Antonio, Texas. She taught art in public schools after graduation and was a finalist for Texas Teacher of the Year in 2001 for her work with at-risk students. She continues her painting studies with Gwen Fox in Taos and Ellen Rolli in Boston. 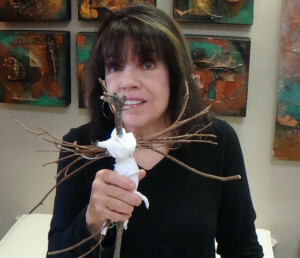 Lyn teaches mixed-media workshops at Lyn Belisle Studio in San Antonio which she founded in January of 2013. Her favorite media are earthenware, paper and fiber, and she has recently began a new series of PhotoEncaustic collages, one of which won Best In Show at the 2015 Artists Who Teach exhibit. Lyn has had six one-person gallery exhibits since 2011, and just retired from the faculty in the Computer Science Department at Trinity University to work full time at her Studio. She is represented by La Vida Gallery in San Antonio and Dan Pfeiffer Gallery in Fredericksburg, Texas. Please visit her website, www.lynbelisle.com to learn more about her art and her workshops. I went to Santa Fe recently and visited the Encaustic Art Institute at your blog suggestion. What a delight! The first day I went, the gallery was closed and I peered through the front window. I recognized your work instantly. Thanks so much for the heads up about the exhibit and the Institute.